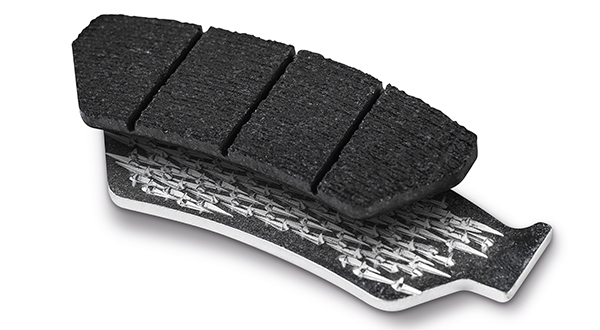 Danish specialist SBS Friction has announced that it has "secured a 100% safe brake pad programme" by embracing mechanical bonding for their ceramic and sintered brake pads. Last year SBS succeeded in launching a sinter material for street brake pads using NUCAP Retention System (NRS) technology for their SP programme. Now a new range of world leading road racing brake pads with NRS technology has been tested for a year and will be launched with a new Dynamic Racing Concept at EICMA. 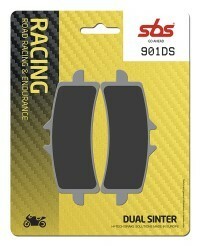 SBS says it has committed to going towards being "100% NRS Safe" throughout its brake product line. The NRS technology is said to be the most advanced mechanical pad to backing plate attachment technology in the industry with a zero-failure rate in over a billion units worldwide. "There is no room for error in motorcycle braking. By going 100% NRS Safe, SBS is using the very best in mechanical attachment of the brake pad compound, enabling riders to feel confident that they are using the safest performing brakes available," says SBS Friction CSO Christel Munk Pedersen. "The braking environment demands components that are capable of standing up to violent vibrations, an incredible heating and cooling cycle, plus chemical, weather and road debris issues - brake pads are expected and needed to perform flawlessly in a severe and hostile environment. It is well known that traditional adhesives do not necessarily handle these extremes as well as the NRS method and can be prone to failure, leading to detachment of the pad from the backing plate. NUCAP says it is the "global leader in brake system component innovation and manufacturing". With locations in Canada, China, Spain and the United States, NUCAP co-develops and supplies "next generation brake safety technologies to the world's leading brake pad and shoe manufacturers and distributors". "NRS Safe attachment is a mechanism that simply does not fail," states NUCAP CEO Montu Khokhar. "NRS is a patented process that modifies the surface of disc brake backing plates, adding a consistent matrix of raised steel hooks that facilitate a mechanical bond between the disc brake plate and the friction materials".